The Italians in New York: A Survey, by Federal Writers Project, 1938, has the following on Santini Brothers, "... the Seven Brothers, Inc., also known under the commercial name Santini Bros., Inc. Founded in 1905 by Goffredo E. Santini, who came to America in that year from Fondagno in Tuscany, this company is controlled, under his chairmanship, by the brothers Pasquale, Pietro, Rinaldo, Agostino, and Marino Santini. All these Santinis are the descendants of the first Santini and his relatives who arrived in this country at the end of the nineteenth century." All well and good. Goffredo Santini founded the company in 1905, and there were five of his brothers who controlled the company in 1938. But that leaves us short one brother. Who was the seventh brother? The first Santini in the moving business to appear in New York city directories was Annocio Santini, who was in business as "express" at 2853 Third Avenue and 718 Westchester Avenue in 1902. The first listing for a Santini Brothers came in 1907 when the brothers were Augustino Santini and Peter Santini. They were located at 931 Westchester Avenue. The same year Annocio Santini was in business at 718 Westchester Avenue. In 1908 a third Santini business was listed in the New York telephone directory. This was C. Santini & Co. at 765 Westchester Avenue. He was Caesar Santini. In 1909 Santini Brothers consisted of Augustino, Peter, and Pasquale Santini. That same year the telephone directory listed G. Santini at 831 East 160th Street. Trow's New York City Directory in 1910 listed Goffredo Santini at this address. The same 1910 directory listed Santini Bros. at 707 and 931 Westchester Avenue, and the brothers at this address were Augustine, Pasquale and Peter. By the time Santini Bros. moved to 609 Jackson Avenue, 1913, the brothers seem to have been this same three. At that time G. Santini at 822 East 160th Street was identified as Giovanni Santini. Trow's 1914 Copartnership Directory listed Santini Brothers at 607 Jackson Avenue and 705 Westchester Avenue, with Pasquale Santini, president, and Goffredo Santini, vice president. Augustino Santini was included as a director. The following year Santini Brothers consisted of the same officers and the same three directors. In 1916 and 1917 Polk's New York City Directory had Pasquale, Goffredo and Paride Santini as president-treasurer, vice president and secretary respectively. From 1918 through 1920-21 only Pasquale and Goffredo were mentioned. Then in 1922-23, 1925 and 1933-34 four brothers are listed: Goffredo, Martin, Augustino and Paride. The first usage of Seven Brothers as synonymous with Santini Brothers came in the 1927 New York telephone directory. In 1935 Pasquale Santini, age 61, died. His obituary notice in the New York Herald Tribune, 4 May 1935, pg. 12, credited him with founding Santini Brothers: "Pasquale Santini, founder and former president of Santini Bros., Inc. a moving concern in the Bronx, died of blood poisoning Saturday in the Royal Hospital, 2021 Grand Concourse, the Bronx. The original injury was a slight cut he inflicted while shaving. He was sixty-one years old. His moving company, in which six brothers were partners, was known at first as The Seven Brothers. Mr. Santini returned six months ago from Italy, where he had been for two years with his family. It had been his intention to sail for Italy last Wednesday to rejoin his wife and their twin children. The infection developed three weeks ago." In 1954 Paride Santini, age 75, died. His obituary in the New York Times, 2 January 1954, pg. 11, rounds out the list of the seven brothers: "Paride L. Santini, a member of the firm of Santini Bros., Inc., moving contractors and warehouse owners at 1405 Jerome Avenue, the Bronx, died Thursday in Mount Sinai Hospital after a long illness. His age was 75. Mr. Santini was one of seven brothers who came from the town of Fondagno in Tuscany, Italy. They started the moving and storage warehouse business in 1905 at Westchester and Jackson Avenues, the Bronx. Their initial equipment was a horse and wagon. The business has progressed since that time into one of the best-known companies in this field. Five of the brothers survive. They are Peter, August, Martin, Godfrey and Rinaldo Santini. Also surviving are his widow, the former Josephine Michlini; two sons Lieut. Col. Leo A. Santini, U.S.A., and Louis R. Santini; four daughters, Mrs. Ralph Imperato, Mrs. Remo Galli, Mrs. Frank E. Toscani and Miss Albina Santini, and six grandchildren." In 1956 Goffredo Santini, age 76, died. His obituary in the New York Times, 23 June 1956, pg. 12, mentions four surviving brothers: "Godfrey E. Santini of 86 Gramatan Drive, Yonkers, president and board chairman of the Seven Santini Brothers, Inc., Bronx moving and storage company, died yesterday at Doctors Hospital. His age was 76. Mr. Santini was among seven brothers who came to this country early in the century from Tuscany, Italy, and established their business at Westchester and Jackson Avenues, the Bronx, in 1905. The brothers started with a horse and wagon and built the business into one of the largest in the field. Among Mr. Santini's posts were directorships in the Allied Van Lines and the Mayflower and New York State Warehousemen's Associations. He also had served as a vice president of United Van Lines, Inc., of St. Louis. Mr. Santini leaves his wife, Quintilla; two sons, Godfrey, Jr. and Quentin; two daughters, Miss Dorothea Santini and Mrs. Louis Knebel; four of the original seven brothers, Peter, Rinaldo, August and Martin, and three grandchildren." In 1964 Agostino Santini, age 76, died. His obituary in the New York Times, 6 January 1964, pg. 47, left only Martino and Rinaldo alive. "August Santini, a founder of Seven Brothers, a moving and storage company, died yesterday at Whitestone Hospital. He was 76 years old. He and six brothers of his organized the company in 1905. Mr. Santini lived at 22-16 94th Street, Jackson Heights, Queens. Surviving are his widow, Mrs. Louise Michelini Santini; a son, Serafino; two daughters, Victoria Fellin and Leona Ellenberger, and two brothers Rinaldo and Martin Santini." In 1976 Martino Santini died. His death notice in the New York Times, 11 February 1976, pg. 48, did not mention Rinaldo: "Santini - Martin, Sr., of the Bronx, N Y, on Feb 9, 1976, beloved brother of Mary Agnes (Fellin) Santini, father of Mrs Joseph (Leonette) Benedetti, Martin L and William T Santini. Funeral from Havey's Funeral Home, Inc (West), 107 North Broadway, Yonkers, N Y, on Friday, Feb 13th at 9 45 A M. Mass of Christian Burial at St Theresa's Church, St Theresa Ave Bronx at 10:30 A M. Interment St Raymond's Cemetery, Bronx, N Y. Visiting hours Wednesday, 7-9, 2-4 and Thursday, 7-9 P M."
Santini Brothers were located in the building above, 607-609 Jackson Avenue, from 1913 to 1967. The 1975 Bronx telephone directory listed Concord Storage & Warehouse Corp. and Raymond's Moving & Storage at this address. In the mid-1920s Santini acquired the ten-story building at 1405-1417 Jerome Avenue on the corner of 170th Street. This became their main office, while their Jackson Avenue facility became a branch office. 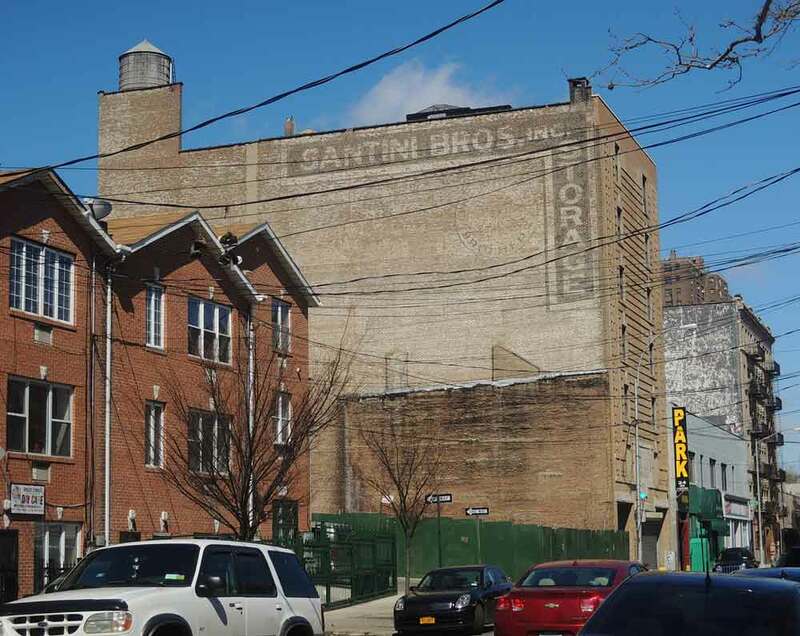 This ad for the Seven Santini Bros. from 1935 gives their address as 1405 Jerome Avenue. This ad from the 1942 Manhattan telephone directory gives the main office at Jerome Avenue and 170th Street as well as the Jackson Avenue location. Very faintly (above the Morgan Manhattan sign) one could still read the words The Seven Brothers on the front of 1405 Jerome Avenue in 2015. There is an inscribed S just below the THE. An image in the digital collections of the New York Public Library shows the Jerome Avenue building with the letters The Seven Brothers Storage above the entrance. The website http://www.ouroldneighborhood.com features a postcard of a Seven Brothers truck with the address 607-609 Jackson Ave. A current (2016) website for the successors to Santini (still calling themselves the 7 Santini Brothers Moving & Storage) has a photo of seven men (presumably the seven brothers) and a photo of the same truck as on the postcard. Unfortunately the site does not contain any history of the company.